You must be wondering why did I quote Roger Federer in a Gandhi titled post instead of a typical Gandhi quote on his death anniversary (30 January). I want you to pause at this moment and read the above quote again, mainly because most of us just read through viewpoints without really considering the merit of the words written. Roger is probably referring to an action in the mind, a state of mind of winners which you may associate with success. In short you’d find it attractive. 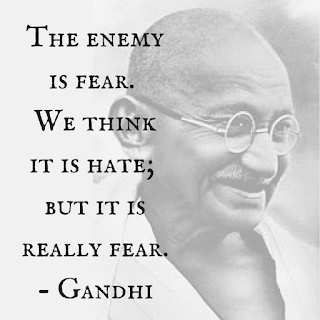 Now I would like to draw your attention to the quote below by Gandhi. Though most of us would believe that to even analyze some brave statements made by stalwarts like Gandhi would mean you have to be like him or live a life as pristine as his. I, however, differ on this. To me every legend comes with special blessings that he/she is able to expand and live up to its acme. None of us are same as they; does that mean we reject all their ideas? I am not here to debate Bapu’s idea if a slap should be retorted back by forwarding another cheek to be slapped again - as goes by a famous Gandhi quote in hindi. But I do want to content the idea that Roger rekindled in my mind about Gandhian philosophy being considerate when facing adversity. Any kind of adversity is basically a challenge inside your head. Your enemy, your stress, your circumstances could be one of them. When faced with sudden changes or deliberate slow painful recovery, how and what tops your priority list while responding to that challenge – reveals who you are. When Roger hits the ball, he doesn’t imagine hitting the opponent for hitting the opponent would neither make him any better player nor would it help him to score better. If anything it would desolate his game. Similarly everyone (not some but almost everyone) when faced with an adversity in life chooses first to blame the doer before he/she reacts to the situation. It is incomprehensible for us to believe that the doer and deed might be two different things and in reacting to the doer we spoil our response to the deed. 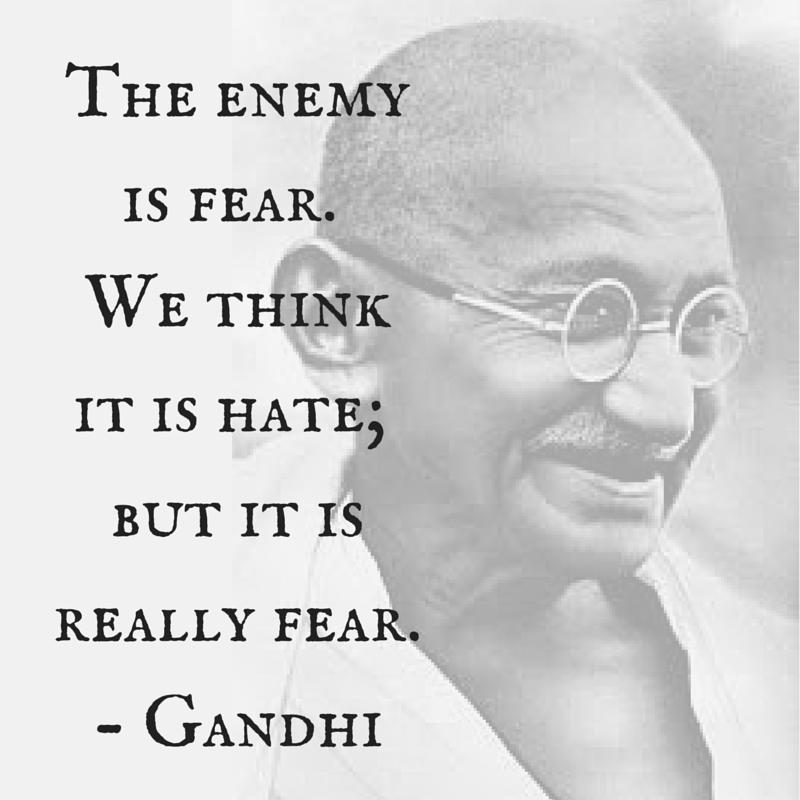 Hence, Gandhi’s philosophy to be aware and considerate towards your adversity. I am not trying to tell you that you put up with oppression or tolerate unto death. Those are extremes I can give no opinion on, but what I can definitely bring to notice is a side of untouched human behavior. Righteousness that refuses to accept that we too have the same components inside us to do as much bad as the doer of the wicked deed did, this refusal is the pitfall of the society today. In simpler words when we refuse to recognize that we too can be sinner at times (at least to some extent) due to our righteous perception of “Self”, we refuse compassion to the very result we want to generate and we refuse our own growth. Any kind of growth needs direction in space and nourishment. The direction of the space (positive or negative alignment of intentions) and kind of nourishment (feelings) decides the fate of our growth. In short, to understand our adversity from a vantage point of compassion will feed our growth with compassion and understanding, while feeding it with anger and aggression will create cancerous surge. The doer, people in pain can do painful things. Only those who have been hurt can hurt others. Simply acknowledging their pain and then responding to their deed can open floodgates of creative responses and spur our own growth. Take into consideration case of Julio diaz (his story - http://www.huffingtonpost.com/2008/04/06/man-buys-dinner-for-his-m_n_95178.html ) who was just mugged by a masked teen on his way back to dinner. He could have blamed the doer as a wicked drug addict teenager who stole his money and left him hungry. Instead his compassion led him to recognizing the need of the mugger and eventually his own growth in experience. Though this may not work all the time, I confess it is not easy either but it is those fleeting moments when you realize that as much as you recognize you have components of the bad then you also recognize you have components of the good, your true power. All of this without being judgmental about the doer. This is liberating. It is when you realize that anger, hurt, pain, frustration is just vacuum created by absence of love and compassion. Your true power is in like Roger says hitting the ball not the opponent; your true power is in knowing you cannot control the doer by being judgmental against him/her, it is in knowing that you are exercising your choice when you face the deed and resolve it rather than trying to correct the doer. A Harvard Psychologist and TEDtalk star Amy Cuddy puts it in her book PRESENCE “ A truly confident person does not require arrogance, which is nothing more than a smoke screen for insecurity”, could this also be said about groups? Us, we as a society ?. Where can you use it right now? For the time being try it on American President D.Trump. Instead of trying to focus on rhetoric of Trump 24x7, the global community could address the underlining fears against immigrants. Had Gandhi been alive he would have probably done Prarthna Sabha or prayer for Trump, to fill his heart with more faith and love or given him roses like our bollywood movie Munnabhai MBBS to get well soon or called on to him to discuss his doubts and fears. Biases cannot be fought with biases, biases are created because there are mis-understanding or mis-representation of facts. Humans being logical are inclined to search for the truth, the illusion of which coming from the other side tricks us to believe that the larger group always speaks the truth. The story of Ramayana, Lord Ram or Gandhi’s inspiration was epitome of this leadership. While he recognized and waged war against the mighty Ravana for kidnapping his wife Sita, all through the Ramayana he never once uttered any ill word against Ravana giving utmost respect to the strength and knowledge Ravana had. Ram attacked the sin not the sinner, he played the ball not the opponent. Ram could free his mind and his Ego, thus he was the Purna Purusha “the complete being”. Can we even try? As a US resident, it's nice to read something that enables a step back and a deep breath. perhaps people will be less neglectful of inner hygiene in the coming years? I am happy I could give this topic a fresher perspective. Well honestly right now it doesn't look like people in US would let go of Trump for now. Nor does it seem that anyone would offer their sane mind for three reasons. 1. Western philosophy is always about either right or wrong, rewards or punishments therefore for them to consider a unique creative way to deal with Trump economics would mean that Trump is off their hook of criticism. That is unacceptable when you approach something with the mindset of right and wrong. Psychologically speaking its confirmation bias. 3. Groups anywhere in the world suffer from this state, stating anything starkly opposite to that of the group may even mean social exclusion. Currently the group norm is to stand ethically correct hence anyone who might even want to offer a different opinion might end up like a right wing unethical person. It thus becomes very essential for any solution oriented person to have backup from men/women of substance from past. My article just tries to provide that substance, to state that like Buddhism there is a middle path but you have to look for it and work on it. Phew that was long!! Thanks for reading James and let me know if you disagree with my points. The wise do not fear the result of their deeds because their deeds do not define their identity for them if anything their deeds and its result become learning experiences. For the fools or say disillusioned their deeds sprout from who they are and define their existence example one person for whom success is defined by money only. That is the reason their effort is imperfect as they never learn from their acts. Thank you Gautam for your comments. Hope you keep visiting.